The premise is simple: write a message on a provided notecard and then give it to someone to show encouragement, reassurance, or a bit of kindness. Seems easy enough, right? Troy Melnyk is a 19-year-old Clifton resident who seeks to build social connectivity. Melnyk and his family created Troy Gives A Duck, a project that builds community, acceptance, and personal relationships by sharing positive messages with people. And for Melnyk, who lives with isolation in the absence of connectivity, building these relationships is of great importance. Melnyk has Angelman Syndrome, a rare neurogenetic disorder. The project was created by his parents and friends to show how a single person with a positive message can create a chain reaction of community building among others, providing them with a physical reminder that they are valued and that there is goodness to be found, even when someone may be struggling. Meetups are designed for groups of people to spend time together, have fun, make personal connections, exchange stories in casual settings, and pen positive messages for people to share with the community. They’re at a variety of places, including public libraries, schools, breweries, universities, and senior centers. At a meetup, participants create hand-written messages filled with simple words of encouragement that can be directed towards a friend, coworker, or a stranger in line at Starbucks. Messages of kindessThe written messages are paired with a variety of duck “gifts:” lapel pins, stickers, decals, and other objects provided by Troy Gives A Duck. 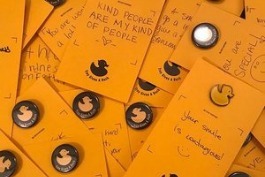 People who participate at the meetup and write the messages leave with a handful of duck gifts. They also leave behind additional messages for Troy to distribute on his own. By sharing a nice thought or the origins of “giving a duck” in person or on social media, messages can continue to spread positivity anywhere in the world. You can catch Troy Gives a Duck next at Donkey Coffee in Athens on December 1 from 2–4 p.m. For more information about the project and how to get involved, follow @TroyGivesADuck on Instagram or Twitter, or visit troygivesaduck.org. Troy Gives a Duck is one of the 2018 recipients of the grants available through People’s Liberty, a philanthropic lab that brings together civic-minded talent to address challenges and uncover opportunities to accelerate the positive transformation of Greater Cincinnati. People’s Liberty invests directly in individuals through funding and mentorship, creating a new, replicable model for grant-makers in other cities.